In the aftermath of the Dallas Stars 3-2 loss to the Nashville Predators on Monday night, there was a lot of talk about blame. Whether it was Ben Bishop channeling his inner Kari Lehtonen or a stagnant power play, something caused the Stars to lose. Since you can’t change the past, we move forward. Head coach Jim Montgomery still likes a lot of what he is seeing. As humans, we’re a bit hardwired to seeing, and in many cases needing, cause-and-effect relationships. Our successes are a result of something, whether it’s hard work or smarts. Personally, I’ve taken it upon myself many a time to will a bust card for a dealer in Vegas, and I’m not that interested in your theories about why that isn’t so. This becomes problematic when it comes to hockey, especially playoff hockey. In the NBA, when teams play a best of seven series, the better team wins about 80 percent of the time. To get that kind of predictability in the NHL, they would need to play a best of 51 series. With the Stars coming in as the fourth seed, predictability may not be in their best interest. If the NHL wanted to crown the most deserving champion, they would put a garland on the Presidents’ Trophy winner. But that wouldn’t be nearly as much fun. 62 regular season wins for the Tampa Bay Lightning doesn’t match the theater of a four game series sweep by the Columbus Blue Jackets. Team loses 3 games any other time of year, eh, no big deal. Being the better team over 6 months is significantly more difficult than winning the playoffs. All of this being just a roundabout way to get back to the headline Montgomery quotes after Monday’s loss. The Stars played well enough to win and if they play that way every game, they will win more than they lose over time. In the playoffs and in a seven-game series, that may be the best that fans can hope for. The Stars made several lineup adjustments for Game 3, and with last change, also had opportunities to set preferred matchups. Within the forward group, most of these adjustments were successful. Jason Spezza came in and was dangerous, certainly enough to keep him in the lineup for Game 4. Valeri Nichushkin had one great scoring chance, but his overall play likely kept him in the same fourth line/nacho conversation in the press box as Tyler Pitlick. A healthy Mattias Janmark keeps them both in the press box. Defensively, Jamie Oleksiak was not on the ice for any goals against, but the pairing with Ben Lovejoy was no improvement over Taylor Fedun. With Nashville playing a smaller, faster lineup, Fedun’s mobility probably makes him the better choice on third pair. Montgomery shuffled the lines within the game on Monday night, and in doing so may have identified a top nine that works. Certainly, the reunification of Jamie Benn with Tyler Seguin and Alexander Radulov created the most dangerous trio on the ice for either team. In limited time together, Roope Hintz centering Mats Zuccarello and Jason Spezza showed potential. Finally, moving Jason Dickinson onto the left wing with Radek Faksa and Blake Comeau put some offensive teeth into a putative checking line. The starting lineup for Wednesday night may not reflect it, but there are options out there if in game adjustments need to be made. Nashville’s forward performance is a bit easier to track than Dallas, primarily since head coach Peter Laviolette doesn’t make nearly as many changes mid-game. On Monday night, the Bonino checking line came out against the Seguin line and applied solid pressure, which was one of the driving factors in the Predator’s fast start. However, the only Nashville line that maintained constant pressure throughout the game was the fourth, as Rocco Grimaldi, Calle Jarnkrok and Miikka Salomäki took advantage of their speed, especially against the Stars’ fourth line. Going into tonight’s game, there are several things that should make the Stars feel good. 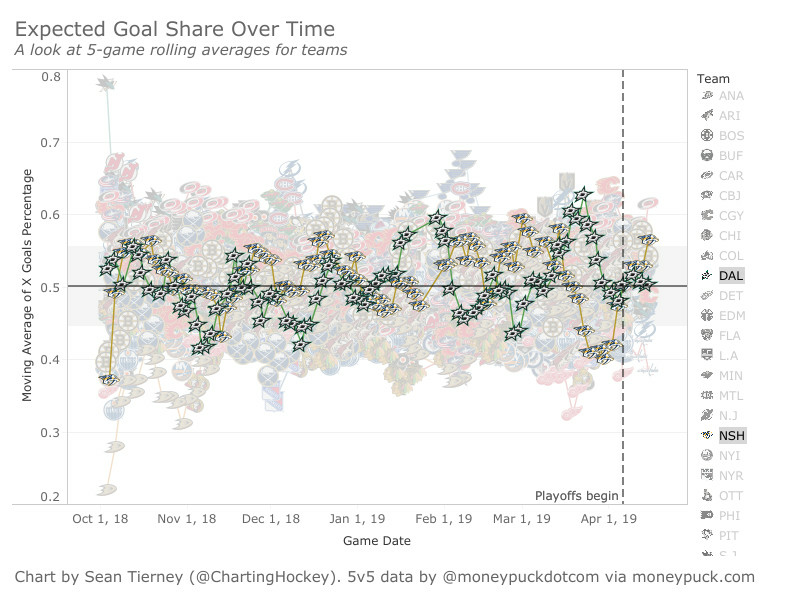 That doesn’t guarantee that the puck will bounce the right way, but all things being equal, this series has the feel of one with multiple more acts left to play. Moving averages can be tricky. Nashville is up due to their Game 2 performance. Both teams continue to play good hockey. Ben Bishop in the net. This game just has the feel of a bounce-back game for Bishop. First period. The jitters of a first playoff game in Dallas are long gone. The Stars need to flip the script early in this one and come out with pressure on Nashville. John Klingberg. Miro Heiskanen has been grabbing the headlines, but Klingberg has been steady and could be due for a breakout game. Knock on wood. Forsberg, Johansen, and Arvidsson have been ghosts, and are best left unseen. It goes without saying here, but the Predators’ top two defensive pairs plus Pekka Rinne in net are rock solid. Throughout the series, the Stars have had to earn their chances. Time to start looking for the ugly goals not just the pretty plays.